February is Dental Health Month. Preschoolers are just beginning to form healthy habits. Exploring teeth, dentists, and related topics helps them begin to understand the importance of caring for themselves. They can also begin to learn about the people in the community who help with dental care. These 20 activities can provide opportunities for preschoolers to learn more about their bodies and about dental health. 1. Dental Health Science Experiment (Pre-K Pages) – We explored this fun Dental Health Science Experiment that emphasized the effects of different drink choices on our teeth and the importance of brushing. 2. 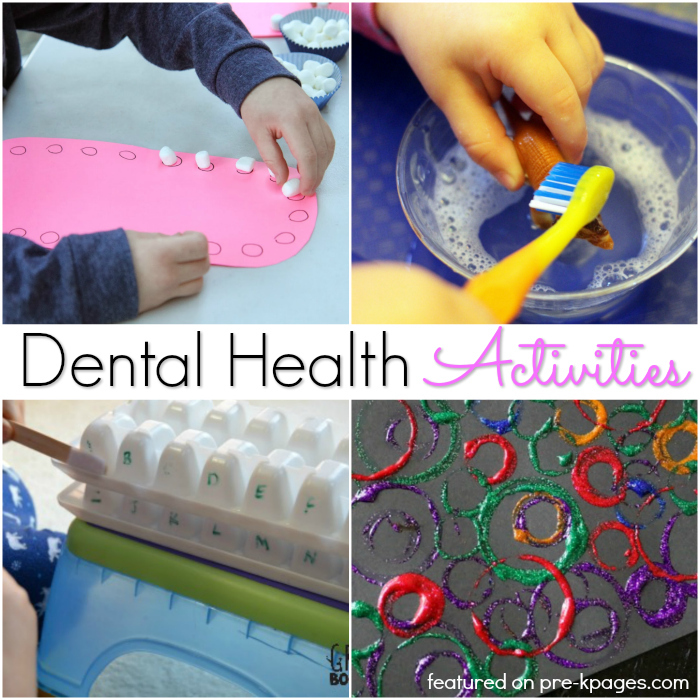 Activities for Dental Health Theme (Pre-K Pages) – From books, to literacy activities, to syllables activities there is plenty for your dental theme in your classroom! 3. Toothbrush Practice (Teach Preschool) – Your students will be discuss dental hygiene while they get in a little tooth brushing practice. 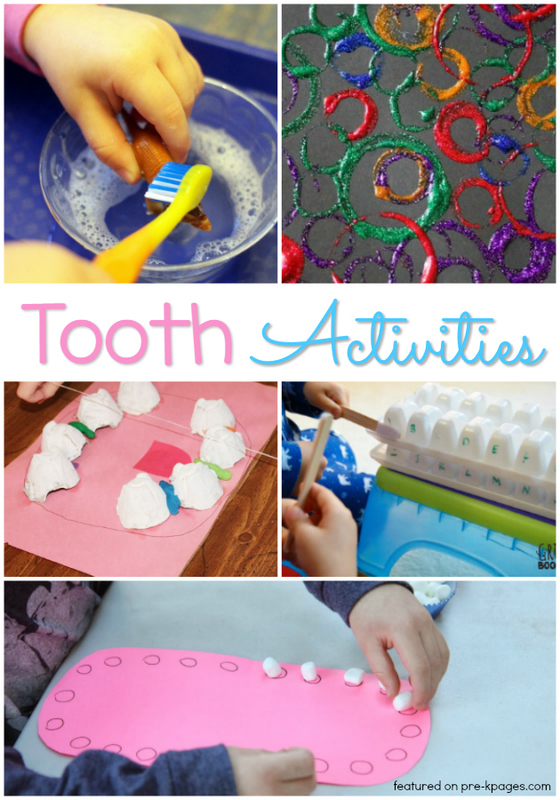 Your students will have fun with tooth brush water play in this activity! 4. Dental Health Sensory Play (Still Playing School) – Using a play doh dentist kit, your pre-K or kindergarten students will enjoy that they get to see, hear, smell, taste, and touch the toothpaste! 5. Make a Model Mouth (Teaching Mama) – Create a model of a mouth out of construction paper and marshmallows. Your students can practice placing the glue on the circles for the teeth. 6. Brush Away Alphabet Germs (Growing Book by Book) – This activity practices letter identification and learning about the importance of proper teeth brushing. We also have a fun song to sing while playing. 7. Toothpaste Slime (Still Playing School) – Your preschoolers and kindergartners will have fun playing with slime that looks just like toothpaste for Dental Health Month. It is the perfect material to invite kids to explore for fine motor, sensory, and pretend play! 8. Flossing Activity (Teaching Mama) – With this hands on activity your students will get excited about flossing. 9. Learn To Brush Teeth With Eggs (Teaching Mama) – Using hardboiled eggs and various liquids, your students can practice brushing teeth with this activity. 10. Elephant Toothpaste (Teach Preschool) – Everyone will love this science activity to go along with your dental theme lessons. 11. Painting with Toothbrushes (Mom to 2 Posh Lil Divas) – Students will enjoy painting these large teeth! 12. Dentist Play Dough Pretend Play (Fantastic Fun and Learning) – In this activity, your students will enjoy getting to play dentist while also working on their fine motor skills. 13. Flossing Activity With Egg Carton (Meet Penny) – Using an egg carton, your preschoolers will be able to practice flossing. Using a teeth anatomy worksheet, they will be able to learn the different names of the teeth and their functions. 14. Electric Toothbrush Painting (Teach Beside Me) – Use old toothbrushes to make some beautiful art! 15. Exploring Teeth (Teach Preschool) – “The Tooth Book” by Dr. Seuss is a delightfully simple book for young children that talks about teeth through wonderful illustrations and simple language. 16. Dinosaur Scrubbing (Sugar Spice and Glitter) – Your little ones will see the importance of scrubbing with these toy dinosaurs. 17. Toothpaste Caps Circle Art (School Time Snippets) – Create art by using old toothpaste caps and glitter paint! 18. Science Experiment: What Do Sugary Drinks Do to Your Teeth? (Feels Like Home) – Learn the importance of brushing in this fun visual science experiment with eggs. 19. Liquid Chalk and Toothbrushes (Glued to My Crafts) – Just a few simple ingredients and you can make liquid chalk and use toothbrushes to create art. 20. Books and Activities for Dental Health Theme (Kindergarten Chaos) – This ultimate list of books and activities will be super helpful when it’s National Children Dental Health month. Also check out Dental Health Literacy Activities and Dental Health Math Activities in our store. Follow my Dental Health Pinterest Board for more great ideas!